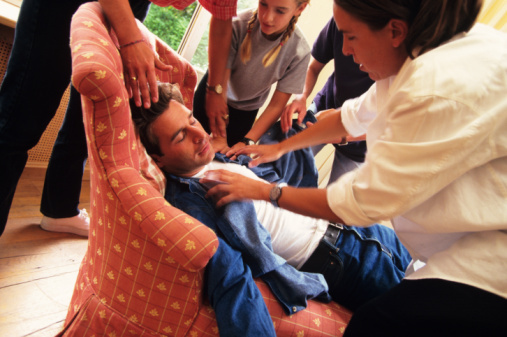 Fainting or syncope means temporary loss of consciousness due to lack of oxygen in the brain. The victim suddenly becomes pale and has a feeling of weakness and nausea, then falls to the ground. In most cases, recovery is rapid, often within a minute or two. Fainting spells frequently follows period of fatigue due to overwork. Standing still for a long time may bring on faintness and dizziness. This may also occur after a person has been in bed for a few days of weeks. Just the simple act of getting up around will bring on feelings of weakness, because the normal balancing mechanisms of the body have not been malfunctioning during the illness. Any sudden emotion shock may cause fainting, probably because many of the smaller blood vessels are relaxed and there is not enough blood to fill them. This result in a rapid drop in blood pressure. Any pressure in the neck, particularly over the carotid arteries, may reduce the flow of blood to the brain and cause fainting or dizziness. This may come on from wearing a tight collar. Many nervous people suffer from fainting spells, especially at the sight blood. Others become dizzy because of breathing to much air. In their anxiety they feel they are not getting enough air, when in reality they are getting far more than they actually need. This is known as the hyperventilation syndrome, a condition in which there is often fainting and dizziness. Such people should breathing into a paper bag the moment this strange feelings come on. Breathing the same air several times in succession will quickly raise the carbon dioxide level in the metabolism and restore the normal chemical balance of the body. Keep the patient lying flat with head low and the feet slightly elevated until he regains consciousness this may be all the treatment he needs. However, he should see his doctor to be sure there is nothing more serious. The doctor will want to rule out heart disease, high blood pressure, and other conditions such as diabetes. People who suffer from fainting spells should avoid extra on hot days. A well-balanced breakfast in the morning, followed by a regular meals at midday and night will help to keep the blood sugar at normal level all through the day. A good program of exercise will help the blood vessels to maintain their normal tone. But all such activities should be done in moderation, especially after some prolonged illness. I have done a lot of reading, maybe too much reading, about conditions related to ENT and breathing. It seems like a neti pot is a good idea though, and will certainly help keep everything clean up through the sinuses. I also read where balloon sinuplasty is being used more as an alternative to sinus surgery which is good news as my sinuses have been getting worse and I have a feeling they are chronic. 24. Heya i am for the first time here. I found this board and I find It truly useful & it helped me out a lot. I hope to give something back and help others like you helped me.